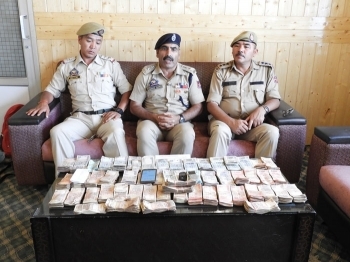 Three juvenile arrested for breaking the donation box at Hazrat Mir Amir Kabir Masjid, Shey on August 2 by District Police, Leh on an intervening night of July 31 and August 1. The case under FIR No. 91/2018 U/S 379 RPC was registered in Police Station, Leh through Police Post, Choglamsar. In a press conference on August 4, at SP office, Leh Farooq Qaiser, KPS, Additional SP, Leh said, “During the intervening night of July 31 and August 1 we got the information that some unknown persons entered the premises of Hazrat Mir Amir Kabir Masjid Shey. They broke open the locker and decamped with the cash”. “We started the search operation and suspects were rounded up which led to the arrest of the three juveniles who confessed their involvement in the case. A stolen sum of â‚¹ 2,51,630 was recovered near Hazrat Mir Kabir Masjid Shey concealed in a bag and was hidden in the bushes”, he added. He informed that all the three accused are in the age 15-16 years hailing from Kargil. The case has been handed over to District Juvenile Officer for further investigation. Farooq Qaiser, ASP informed that they were also involved in one of the previous theft cases in Leh. The case has been cracked by SI, Rigzen Gurmet, IC PP Choglamsar under the supervision of Inspector, Tsewang Dorjay, SHO Police Station Leh and Farooq Qaiser, KPS, Addl. SP Leh under the overall guidance of Sargun Shukla, IPS, SSP, Leh. Whoever commits theft shall be punished with imprisonment of either description for a term which extend to three years, or with fine, or with both.